Good Afternoon, Folks!! Just another card using scraps. I've had this large tag in a scrap pile, like. . .forever. I used to take my scrap cardstocks and create tags using dies but then never used them. They end up becoming just a scrap. Well, I'm going through this little package that I had stuffed all these punched shapes and only now beginning to use them. If you see some of my recent cards, I've used tags for the design. Again, I'm using the chipboard stickers from Heidi Swap. I just noticed the little heart in the center is crooked. I need to straighten it out! The XOXO sticker is from a left over sticker pack by Pebbles Inc. The heart brads are from JoAnns and the designer papers are from DCWV. 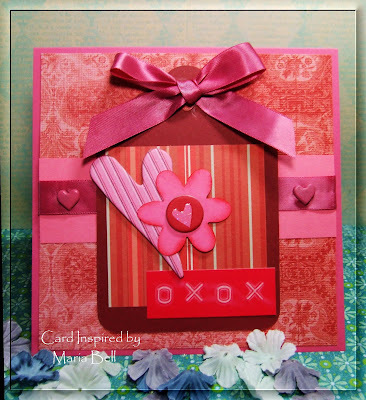 The cardstock is by SU - Regal Rose. I'm not sure what cardstock I used for the tag and the ribbon's brand is unknown. The ribbon is a scrap piece too. Ya-hoo!!! Your going to town girl with all these gorgeous scrap cards!!! That's such a pretty card Maria. You'd never guess it was made from scraps, it's just beautiful. Crickey, you have been a busy bee Maria! I am loving all the cards you've been making - the colours are gorgeous! Fabulous! You would never know you were using up scraps! Maria you turn scraps into treasures and your card is beautiful! I wish my non scraps cards would look that good!! It's gorgeous Maria!